an electrically driven miniature racing car which travels in a slot in a track. an Augmented Reality (AR) app to build tracks and race versus your iDevice or your friends. A hidden treasure, winding corridors and stairways in unexpected places: Maze Manors is a simple yet intriguing game, where reasoning and intuition are both necessary to win. 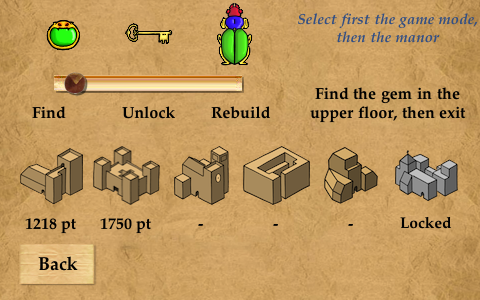 The mutable map of each floor is gradually revealed, so that every move is crucial to achieve the best possible score, while the simple and elegant graphic highlights the structure of the building. Why "mutable"? 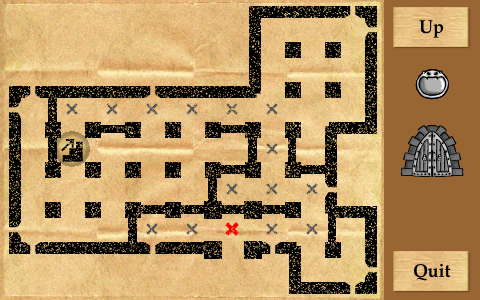 Two reasons: first, Maze Manors incorporates a topology generation algorithm, thanks to which even with the same map type, each game is always different and surprising. Second, after reaching the goal, you have to exit back ... but it might not be as easy as you think. Three game modes and the included maps allow you to experiment with growing difficulties, and will test your quality of seekers! And... should you feel unsatisfied by your endless records, try the multiplayer mode! Press the "Connect" button in the map selection screen, and challenge a friend to find the treasure faster than you... the first player exiting the manor wins! Current Dice Studio release adds exciting functionalities to the application. In addition to iOS 9 compatibility and retina display exploitation, even "old" devices can enjoy a smoother graphic, thanks to OpenGL multisampling. And don't forget the capability, available since 1.1, for quickly and easily insert of custom symbols on every dice side, selected from a palette of 100 graphics icons. For example, you could create a 6-sided dice with meteo symbols that represent the current weather for the day; or you could throw a dice painted with different weapons, in order to assign which one of them will be used during next battle. The standard symbols are useful per se, but you can consider them only as a suggestion: in fact, you are allowed to customize the symbol sheet used in the application. You'll need an external graphic editor, but if you are interested in this, please follow these detailed instructions. 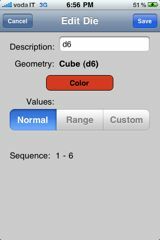 Dice Studio is a utility that allows you to quickly create, assembly and use custom dice; in a few seconds you select its geometry (number of sides), color, and most important, the range of values, or the symbols associated with each side, as you like. Need a 12-sided dice with values from 2 to 24? A 6-sided dice with different smiles representing your opponent mood? A 30-sided dice with values from 0 to 90? It's a snap! And if you really, really need to precisely select a single, specific value for each side, you can do this, too. 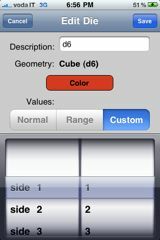 As most iPhone app, Dice Studio is easy to learn; basic operations are performed with the usual conventions. Nevertheless, there are some functions that could be overlooked, or are better understood with a little explanations. Refer to next sections for details. There are two ways to make your dice roll: you can simply tap the button in the top navigation area, or you can naturally move the device and look at your results. The first technique exploit the iPhone/iPod accelerometer, monitoring its orientation: keep it straight, and the dice will jump towards you, incline it to left, and dice will go accordingly. The second technique make a different use of accelerometer data, implementing a custom algorithm to detect the throw: you are free to use the gesture that better suite your style, but the standard gesture should act as if the dice were laid on the device as on your hand, as in following figure: you can throw them with a gentle swipe of the arm. 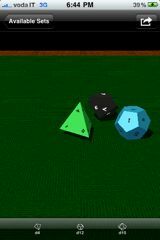 If you look at a 4-sided dice, you see that it doesn't stop with a face pointing up, but with a vertex; as such, from the standard point of view, it is difficult to understand which value is the outcome of the throw. To solve this issue, simply swipe vertically with your finger across the board (after dice stopped), and you'll easy adjust the view as you need. When you add a new dice, it has the standard values preselected (1 on side 1, 2 on side 2, etc.). You can customize the values engraved on every face, using the segmented button in the middle of the screen. In addition to standard configuration, you can choose among two modes: range and custom. 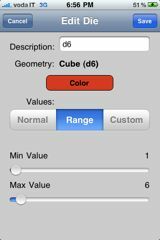 Range - you set the minimum and the maximum value you want on your dice. If the range is superior to the number of faces, the values will be spaced accordingly; on the contrary, if the values in range are not enough to cover every face, they will be repeated as needed. 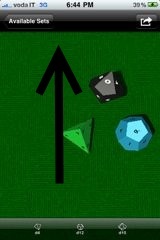 Let take as an example a 6-sided dice. Standard sequence is the usual 1, 2, 3, 4, 5, 6. If you select a range with minimum = 5, maximum = 20, the resulting sequence will be 5, 8, 11, 14, 17, 20. If you select a range with minimum = 5, maximum = 8, the resulting sequence will be 5, 6, 7, 8, 5, 6. This mode is useful when you want to constraint the values of the dice in a quick and effective way. Some race car simulation game use this technique to constrain the high-gear dice to a range in the upper values; for example, Formula D (formerly Formula Dé) sixth gear is a 30-sided dice with values that are equally distributed between 21 and 30 (thus effectively repeating each value on three faces). In other games, like role-playing games and miniature wargames that used percentile-based skills, usually you'll define a 10-sided dice for the tens, assigning a min-max range 0-90; the standard d10 sequence is 0-9, and it can be used for the units dice. Custom - in this mode you have maximum flexibility in the definition of the values for each side. The picker allows you to associate to each side any number in the range 0-99, thus obtaining a truly custom setup; simply select the side you want to modify in the left dial, then move the right dial to set the numeric value. If you activate the "Symbols" switch, you'll associate a special graphic to each side. Usually you'll apply this mode to low-sided dice, as it can be tedious to define 20 or 30 values one by one. But there is a little trick: if you want to associate a contiguous set of symbols, first set them as numeric Range, save the dice, then simply switch the symbols on: the range is translated to the correspondent symbols. 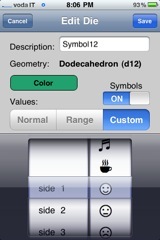 - import the symbols in Dice Studio. Let's see how this steps are accomplished in details. Warning: keep in mind that the change in symbols is global to Dice Studio; even the dice already created, if set to symbols mode, will use the modified graphics. 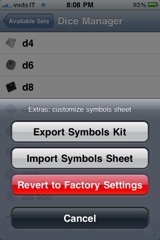 Anyway, should you after some time change your mind, you could Revert to Factory Settings from the Extra dialog sheet. From the Dice Manager view, select the Extra button in the toolbar, then the Export Symbols Kit command from the Dialog sheet. Complete the mail message with your address, and send it. From your desktop station, open your mail application. Locate the message with the symbols kit, and save all five attachments in a convenient location. Open your graphical editor. If it is capable of managing multiple layers, you can use the masks images as guide: every shape on the mask represents the area that will be mapped to a singol side on a specific dice; for	example, using the "SquareMask.png" you can draw symbols that fit perfectly on a 6-sided dice (whose faces are square). Every mask image is tuned to a specific shape of face. Import them in a separate layer, and set its transparency level to something in the middle between completely transparent and opaque. If you want to keep "symbolTexture.png" as base image, import it in another layer, otherwise create an empty layer and draw your symbols in it. In order to draw universal symbols, that is, symbols that fit correctly every type of dice, you'll have to stay inside the intersections of all masks, superimposed each other. Note that for best results, the saved image size must be 512 x 512 pixels (as the original one), and it's better to limit the use of colors (again, consider original symbols as an example). Create a mail message, attach the modified image (without masks), and send it to an account accessible from your iPhone. Open the mail message, tap on the received image and select Save Image. Back to Dice Studio. From the Dice Manager view, select the Extra button in the toolbar, then the Import Symbols Sheet command from the Dialog sheet. Locate the image in the Photo Library and select it. 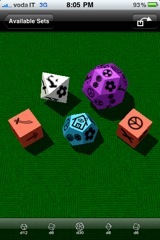 Now, all your dice will display the modified symbols.